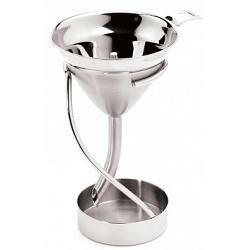 This decanting funnel from Swissmar is made from highest quality stainless steel with a stunning 2-tone finish. The funnel includes a drip catcher base and a mesh filter to stop wine sediments and traces of cork. The decanting funnel oxygenates wine to enhance its taste and aroma.